Comment: The concrete patio is breaking. Comment: My pool deck is a combination concrete with cool deck spray (which I want to keep), river stone, and elevated wood deck. I want to remove the river stone and elevated wood deck and replace with concrete, then use cool deck or spray-on to match the existing concrete pool deck. I want to extend the new pool deck further than the existing wood deck. I may require a step from my house patio down to the pool deck. I also want to extend the concrete to a portion of the side of my house, so I can relocate my BBQ grills to the side of my house. Comment: Install paver patio and walkways. Expert paver installers only. Comment: 10 x 15 patio addition. No Removal. Comment: Build a patio in the back yard area. Just a seating area with no over head roof. Memorial Sprinklers & Landscaping, Inc.
Cypress Concrete Contractors are rated 4.76 out of 5 based on 795 reviews of 59 pros. 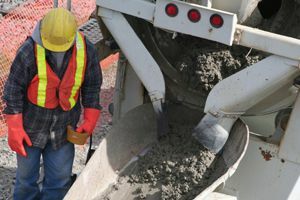 Not Looking for Concrete Contractors in Cypress, TX?